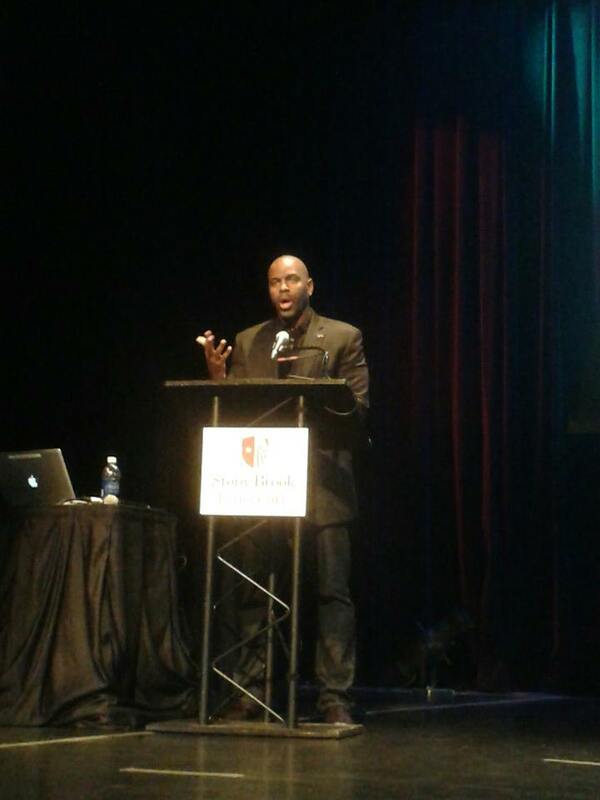 Last evening, Byron Hurt, activist and award-winning documentary filmmaker spoke at Stony Brook University. The event, co-sponsored by the Center for the Study of Men and Masculinities and Stony Brook’s Provost, brought together members of the campus and broader community to hear Hurt’s message about masculinity and violence. A former student athlete introduced to gender theories and anti-sexist and anti-homophobia activism by Jackson Katz, Hurt has focused his energies on exposing how boys have been trained and socialized, how they use hypermasculine posturing to navigate social worlds, and how we as a society have been socialized to remain silent in the face of violence against women. He is particularly interested in engaging average men—men who would never perpetrate such violence—in the project of redefining what it means to be manly. To that end, his films (including I am a Man: Black Masculinity in America, Hip Hop: Beyond Beats and Rhymes, and (forthcoming) Hazing: How badly Do You Want In?) push these average men to challenge other men’s thinking and behaviors. Hurt punctuated his talk with clips from his films. His most famous film, Hip Hop: Beyond Beats and Rhymes, focuses on the world of commercialized rap music. Packaged and sold by a few rich white men, this genre is rife with myths about black men’s masculinity. Hurt exposes these narrow representations for what they are: misguided and misleading attempts to portray black men as vicious, violent criminals. He is clear that hip hop is not to blame for misogyny, though many in the mainstream media might say otherwise. Rather, hip hop is very American—it expresses the same ideas about race, gender, class, and sexuality that we find in other forms of media. He’s also clear that there is much more to the genre than mainstream television and radio would have you know, and that these other artists offer much wider views on the possibilities of black manhood. Hurt offered unseen footage from that film, now set against recent clips from mainstream hip hop music videos. It is clear that not much has changed since Hip Hop: Beyond Beats and Rhymes came out in 2006. In the upcoming weeks, more unaired footage will be available on his website. These clips are great teaching tools, just like his full length films. Two things stood out to me: first, the importance of understanding masculinity intersectionally and second, recognizing the performativity of gender. Hurt emphasizes, in far less jargon than I’m using, the impact of history on current iterations of gender. He sees black masculinity as emerging from a very particular set of historical conditions—slavery, reconstruction, Jim Crow, and persistent economic and social inequality. And he sees gender as performative—we can deploy certain gendered performances for different reasons. These are sophisticated theoretical arguments, yet his films convey them with ease and at a level almost anyone can readily understand. Beyond being informative, his presentation was deeply personal. Hurt shared stories of his career—his early fears of embracing his desire to be an independent filmmaker—and stories about his personal life. His film, Soul Food Junkies, was inspired by the death of his father, whose health was clearly affected by his diet. While masculinity is not the main focus of the film, Hurt ties this film to the topic at hand by explaining how his father may have turned to food rather than express his emotions, something that men are socialized to suppress. These elements made the presentation feel intimate. It is clear that Hurt is an incredibly honest and courageous man. Each film tackles issues that are, for him, quite close to home. As a black man, embedded in hip hop culture, Hurt risked losing credibility and friends through his critiques in the first two films. Similarly, when he questions soul food, he is critiquing a part of his own family’s tradition. And finally, he shared his fear about Hazing: How Badly Do You Want In? ; specifically, that as a former athlete and fraternity member, to question hazing may mean losing connections that mean a lot to him. Taking these personal risks is, I think, the biggest lesson for those of us who care about gender justice, whether our forum is the classroom or the world. Doing something that matters is almost always risky but this fight is worth it.